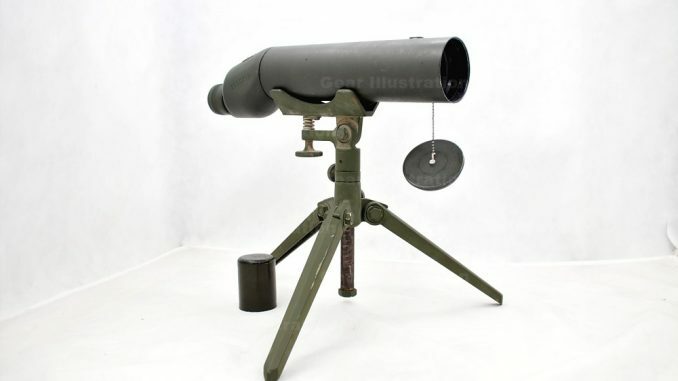 The M49 Spotting Scope, also known as the M49 Observation Telescope, is a multipurpose scope system used primarily for long range marksmanship observation. It can also be used for observing the effects of artillery fires and other general purposes. The M49 is a fixed 20-power telescope with an eyepiece focus. It has a field of view of 2 degrees and an exit pupil diameter of 0.108 inches. The M49 is an erect image instrument that is magnified by the lenses in the eyepiece. The telescope is focused by turning the knurled focusing sleeve. The sniper team carries the telescope on all missions. The observer uses the telescope to determine wind speed and direction by reading mirage, observing the bullet trace, and observing the bullet impact. The sniper uses this information to make quick and accurate adjustments for wind conditions. The lens are coated with a hard film of magnesium fluoride for maximum light transmission. Its high magnification makes observation, target detection, and target identification possible where conditions and range would otherwise preclude this ability. Camouflaged targets and those in deep shadows can be more readily distinguished. The team can observe troop movements at greater distances and identify selective targets with ease.